In addition to the tack room there's an instant need for a storeroom. Whereas the term "room" is somewhat understated, for you need plenty of space for just a couple of horses to store hay, straw, oat, mash, shavings, supplementary forage, etc. When planing the storeroom you shouldn't calculate too tersely. If possible you should allow for some spare room to dry and store blankets, put down tools, etc. Mandatory for the hay and straw storage is the reliably granted rainproofness. If with every downpour water seeps into the store somewhere you will quickly be confronted with mildewed hay bales. And this is not only harmful for the horses that have to eat the scruffy fodder, but also humans will be bedevilled by the unavoidably inhaled fungus spores. In principle our storage space is constructed identical to our selfmade boxes. If done properly those constructions are rainproof and without any difficulty suitable for the warehousing of forage. However, for a long time we had problems at the rim between the bought sheds and the storage build by us. Somewhere the water found its way in here or there. After we unsuccessfully tried for some time to tackle the problem with silicon, we chose the "mace solution". The hole rim caked with a bucket of roof-bitumen and the problem was settled. The main thing is the roof is leak-proof, it needn't look stunning! However, you have the humidity problem not only from above but also from below via the floor. Thus, if possible you cover the store with washed concrete slabs or paving stones. 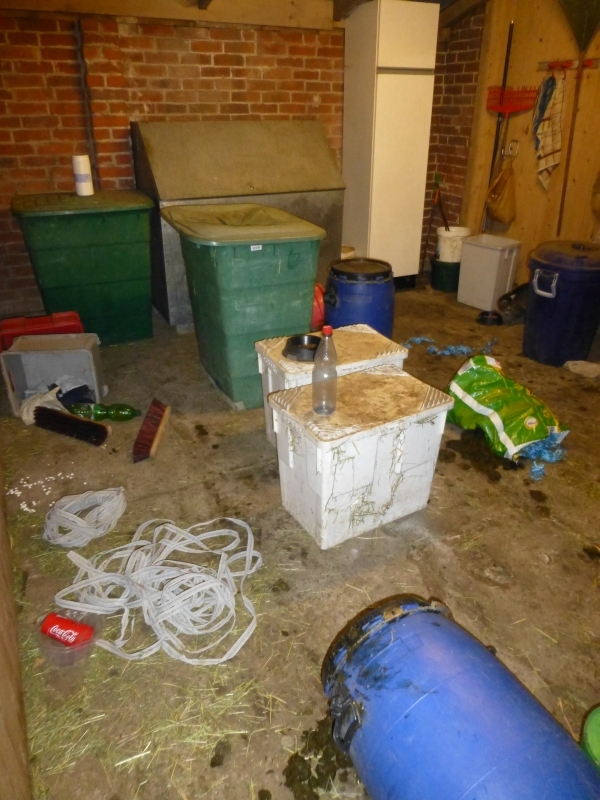 In order that stocked bales don't absorb moisture anyway you shouldn't place them on the bare floor. Instead go to the next truckage company or similar and ask for a couple of old pallets, cover the storage with it and thereby gain a dry, bottom-side vented floor for hay and straw. The stockpiling of round bales and large square bales mostly prohibits itself due to space and handling reasons. Therefor you're reliant on a farmer who presses small HD bales even though these pose much more work for him. Normally you're going to allot the amount of hay for each horse. Hence the acquisition of a hay scale is recommended to weight out the hay bales. The oat, mash and mineral feed stored in the room invariably has to be put into enclosed recptables to tackle the mice problem and to avoid a soiling of the feed. 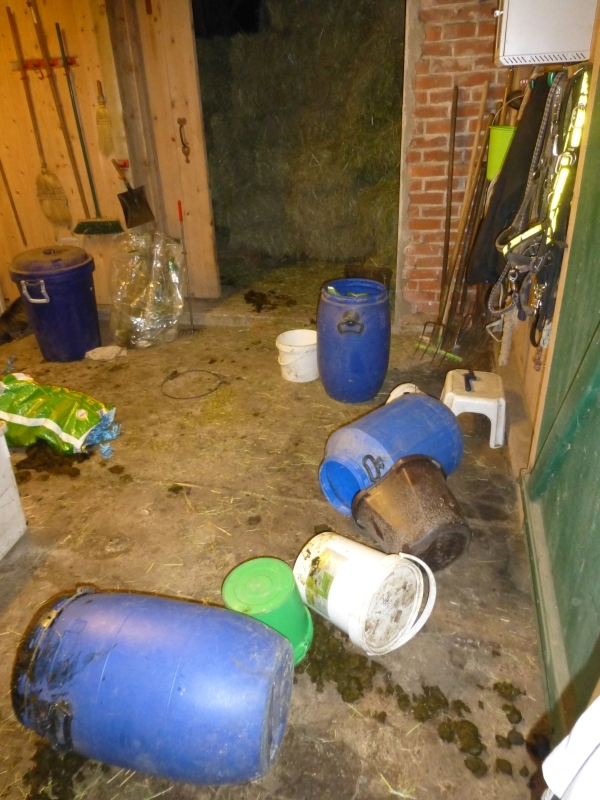 Besides you should secure your storeroom and the containers inside so that the horses will fail to "burglarize" the room and take unregulated possession of the food. On the one hand of course because they are very curious, sift through everything that's not nailed down for eatable stuff and after such a search you have to clear away a huge pile of dirt and demolished things. But on the other hand also for the well-being of the horses themselves. Many a horse that managed to plunder the storeroom had to pay this with hefty colics or even death.